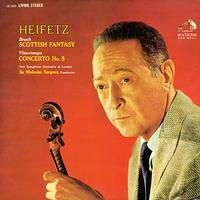 Stunning performances of Heifetz showpieces with Sir Malcolm Sargent and the New Symphony Orchestra of London. Recorded in May 1962 by Kenneth Wilkinson and the Decca Recording team at Walthamstow Hall. This is a must have for all audiophiles! The original 2-track session tapes were used in mastering for LPs and SACDs.